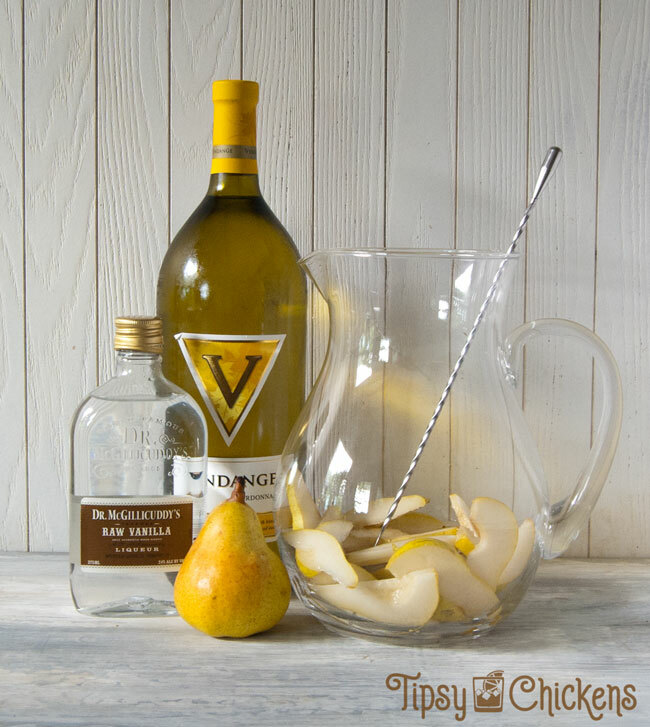 Today we’re making a crisp and refreshing White Wine Pear Sangria. Pears are an autumn underdog. They don’t get the love apples or pumpkins see when the temperatures drop. They have a sweet and delicate flavor that plays well with spice but can be enjoyed all on its own. I wanted to keep this recipe light so I left out the hearty cinnamon and spice flavors ubiquitous in the fall. Grab the ripest pears you can find. When they get riper they get sweeter and juicier. Unfortunately pears are perfectly ripe for 37 seconds so just get as close as you can. Cut them in half and remove the core, you can use a fancy corer but if they’re ripe you can scoop out the seeds and stem with a spoon. 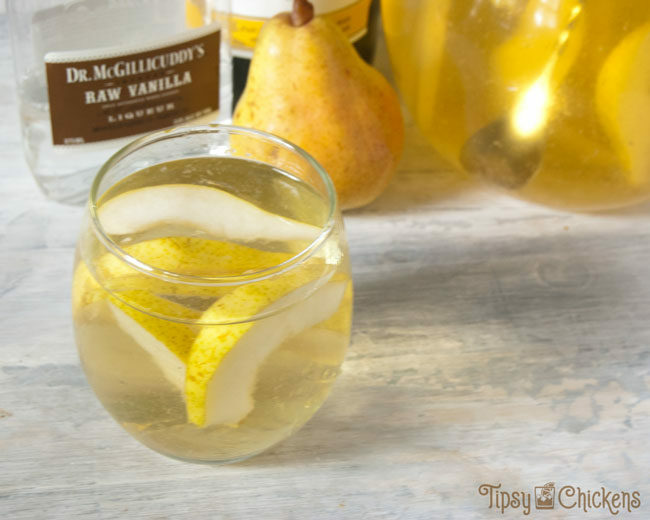 Thinly slice the pears and toss them in your serving pitcher. The downside to pears in your sangria is they.. shed? 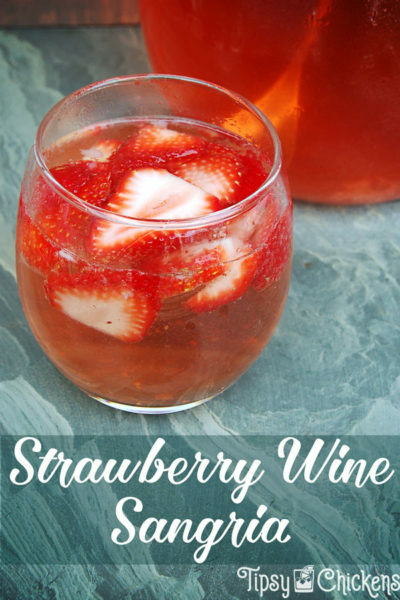 Your pear sangria will look a little cloudier than something like a Strawberry Wine Sangria. 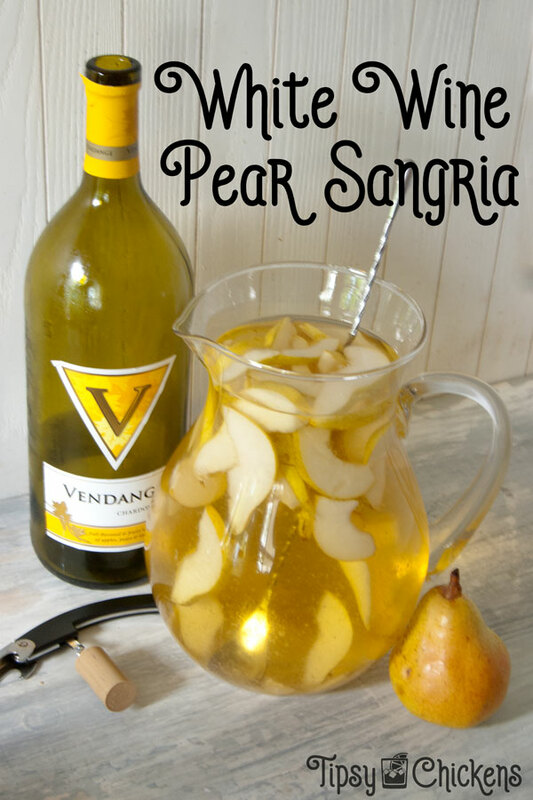 The other key pear player in this sangria is pear juice. Listen very carefully, you need to look in the baby section. We want 100% pear juice, not pear flavored sugar water. Gerber makes it. Sangria isn’t the time to break out the expensive wine. To be fair, on my budget, there is never time to break out expensive wine. Grab just about any large bottle of chardonnay, you’re adding fruit, fruit juice and liquor remember? I picked up a 1.5L bottle of Vendange Chardonnay because the bottle said it had hints vanilla and apple flavor. It also said oak but I ignored that. I’m not the wine police, use what you have or what you like. As long as you stick to something white and fruity that doesn’t taste like gasoline you’ll be fine. We diluted the wine with pear juice so it’s only right that we kick it back up a notch with some booze. Pear isn’t an easy flavor to find in the liquor store and I didn’t want to go too over beard with that specific flavor so I ended up with vanilla schnapps. I’m a sucker for Dr. McGilicuddy’s bottles so it wasn’t a hard choice. 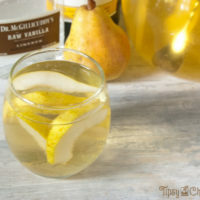 Vanilla schnapps are sweet with a vanilla flavor that melts into the wine and pear. It’s not an aggressive ingredient, which is good because we’re relaxing remember? Don’t forget to Pin this to your Sangria board!